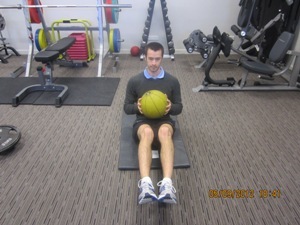 An advanced core and stabilising exercise, the medicine ball twist should only be performed under the supervision of a qualified Peak Body Personal trainer. Step 1- Sit on the floor holding a medicine ball. The feet can be placed on the ground or raised off the floor (more advanced). Step 2- Lean back slightly and then move the ball over to one side without letting the ball touch the ground. Repeat the movement on the other side.